Here's a sample Excel-sheet that contains Purchase Vouchers with VAT and Discount. Follow these steps to import the Excel-sheet data into Tally Software. 5) Next, select the Excel sheet. Remarks:- The XML tags in this case have been written in the Excel-sheet itself. 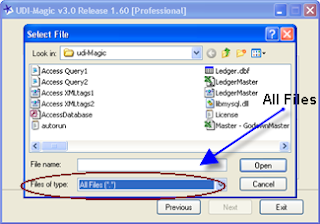 Hence, you must uncheck the option "Use separate file for XML tags" while using UDI-Magic. Here's a sample Excel-sheet that contains Customer and Supplier Ledger Masters. Follow these steps to import the Excel-sheet data into Tally Software. The XML tags are provided in a separate file. While importing data into Tally using UDIMagic, you must select the XML tags file also in the same screen wherein you are prompted to select the Excel Sheet. Here's a sample Excel-sheet that contains Credit Note Vouchers of an Advertisement firm. Follow these steps to import the Excel-sheet data into Tally Software. Normally, in the previous samples the XML tags were written in the Excel-sheet itself (i.e. in the comments section of cell A1). However, in this case the XML-tags are provided in a separate file, hence you must specify the XML-tags file when prompted in the UDIMagic wizard screen. This sample contains a macro-file which does some calculations at run-time. 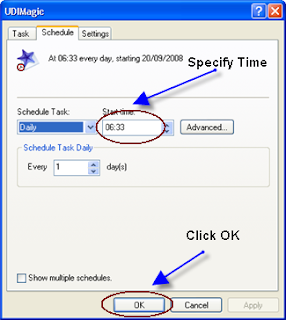 This is required as the Voucher-totals are not manually added and are calculated at run-time. VBA (or Macros) is a very powerful feature in MS-Office applications that allows you to automate tasks. UDIMagic uses this feature to manipulate Excel-sheet data at run-time to perform calculations; add new columns etc. 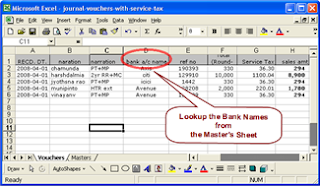 UDIMagic supports import of Masters and Vouchers data from Excel to Tally. It also supports UDF (user-defined fields) created using Tally Definition Language (TDL). A sample Excel sheet "Vouchers - Sales Transactions with Salesman UDF" has been provided for evaluation. To use it, you must download both the Excel sheet and the TDL file. The links for downloading the Excel sheet; TDL file are given in my earlier post "Sales Vouchers with Salesman UDF". Further, you need to enable the Salesman UDF using the F11 [features] key. For more details in this TDL (Salesman UDF), refer our blogsite tdlplayground. This is in continuation of my previous post wherein we had provided a sample Excel sheet with Receipt Vouchers. Herein, a sample Excel-sheet containing multiple user-defined Receipt Vouchers is being provided. Follow these steps to import data from this Excel-sheet into Tally Software. 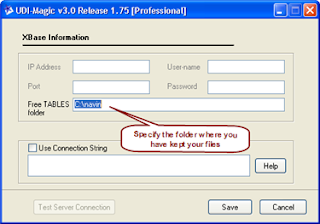 1) Download the Excel sheet and copy it to "c:\udi-magic" folder. 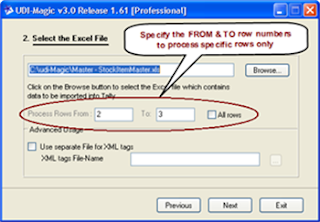 4) Run UDIMagic utility, select option "Excel to Tally -> Voucher". Next, select the Excel sheet when prompted. 5) Next, follow the instructions given in the UDIMagic wizard-screen to import data into Tally. The XML tags are written in cell A1 (comments section) of the Excel sheet. Alternatively, we can write the XML tags in a separate file also. Here's a sample Excel-sheet that contains Receipt Vouchers of an Advertisement firm. Follow these steps to import Receipts Vouchers from this Excel-sheet in Tally Software. 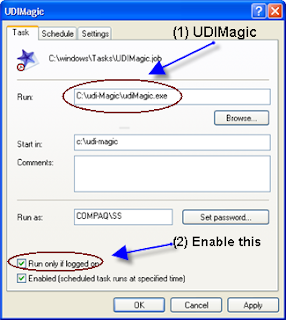 UDIMagic is a simple and robust utility. It allows you to import any data from Excel into Tally including both Masters and Vouchers. How does UDIMagic work ? 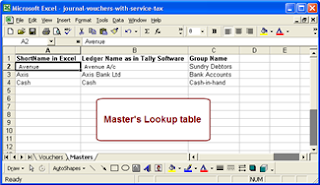 You may have Excel-sheet format with any type of Vouchers or Masters. UDIMagic can process it and send it to Tally within seconds. UDIMagic uses XML tags to identify and read the Excel sheet data. End-users who are not familiar with XML tags, can take assistance of our professionals who provide XML tags for any type of data that you may have in your Excel-sheet.